Not to be confused with Great Astrolabe Reef. Astrolabe Reef is near Motiti Island, off the Bay of Plenty coast in New Zealand. The reef, which breaks the water surface at low tide, is a renowned scuba diving spot that drops off to 37 metres (121 ft) in different parts. The reef was named by Jules Dumont d'Urville after his ship Astrolabe, when it nearly ran aground there on 16 February 1827. On Wednesday, 5 October 2011, the container ship MV Rena ran aground on the reef. By Sunday, 9 October, a 5-kilometre (3.1 mi) oil-slick threatened wildlife and the area's rich fishing waters. By 13 October the ship had started to list and rock in the waves. Over 88 containers, some containing dangerous chemicals, fell into the sea and some washed ashore. The wreck broke in two during stormy weather on 7 January 2012. ^ New Zealand Guide to Select Scuba Diving and Snorkelling Locations:Bay of Plenty Archived 31 May 2012 at the Wayback Machine. NewZealandNZ.co.nz. 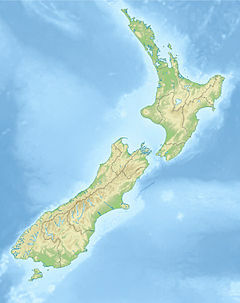 ^ The Discovery of New Zealand: Chapter 4: Cook To D'Urville. Victoria University of Wellington. ^ "New Zealand oil ship leak 'raises questions'". BBC News. 9 October 2011. Retrieved 13 October 2011.